The Robinsons No Added Sugar Apple & Blackcurrant Jelly Pot has no added sugar and is suitable for vegetarians but it isn’t really jelly, it is more akin to slightly solid water in a pot which tastes a bit weird but nothing like apple or blackcurrant. Water , Maltodextrin , Stabilisers (Locust Bean Gum, Agar) , Acidity Regulators (Citric Acid, Trisodium Citrate) , Purple Carrot Juice Concentrate , Flavourings , Sweetener (Sucralose) . Goodness only knows why Robinsons’ didn’t just call this Purple Carrot jelly, they’d probably get as many people buying it the once and only once! 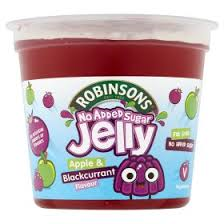 Boycotting Robinsons seems an appropriate response to this lying jelly.